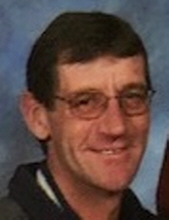 Joseph E. Roessler age 58 of Plain passed away on Tuesday, November 27, 2018 at St. Clare Hospital in Baraboo following an illness. Joe was born on October 26, 1960 in Bear Valley, WI the son of Raymond “Gene” and Beulah (Karl) Roessler. He grew up in the Bear Valley and Loretto Ridge area and worked for Kraemer Brothers for 26 years. Joe was always full of life, energy and loved his family and friends especially Tim, Kevin and Sue. He loved his dog Riley, as Riley went everywhere Joe went. Joe enjoyed fishing, hunting and mowing lawn. Survivors include his parents, Raymond “Gene” and Beulah Roessler of Lone Rock, a son, Ryan (Courtney) Roessler of Greenfield, WI, a daughter, Danielle (Nathan) Peck of Arena, grandchildren, Mason, Maya and Jack, 7 siblings, Mary Jane (Earl) “Cubby” Ruhland of Janesville, Jean Ann (Dennis) Dankert of Reedsburg, Francis (Jamie) Roessler of Lone Rock, Patricia Roessler (Mike Jordan) of Madison, Vickie (Jerry) Nachreiner of Plain, Alan (Diane) Roessler of Reedsburg, Randy Roessler of Janesville, many nieces, nephews, other relatives and friends. He was preceded in death by a sister, Rita Hess. A Mass of Christian Burial will be held on Wednesday, December 5, 2018 at St. Luke’s Catholic Church in Plain at 11:00 A.M. Fr. John Silva will officiate with burial in the St. Mary’s Catholic Cemetery in Keyesville at a later date. Visitation will be held on Tuesday, December 4, 2018 at St. Luke’s Catholic Church from 4:00 P.M.-7:00 P.M. and again on Wednesday from 10:00 A.M. until the time of Mass. Online condolences available at www.staffordfuneralhomes.com. The Richardson-Stafford Funeral Home in Spring Green is assisting the family with the arrangements. "Email Address" would like to share the life celebration of Joseph E. Roessler. Click on the "link" to go to share a favorite memory or leave a condolence message for the family.